Redirecting to: www.famous-trials.com/earp in (10) seconds. Silver is discovered in the San Pedro River valley. Prospector Ed Schieffen names the settlement near the site of the strike "Tombstone." Tombstone elects its first mayor. Wyatt and Virgil Earp arrive in Tombstone, where Virgil assumes the position of deputy marshal..
Johnny Behan (who the Earps believed had a too lax attitude toward law enforcement) becomes sheriff of Cochise County, which includes the town of Tombstone. The Tombstone stage is robbed and its driver and a passenger killed. A posse led by the Earps captures one of the robbers, but he escapes from jail, further souring the Earps on Behan's leadership. Wyatt Earp secretly offers Ike Clanton the $6,000 reward offered by Wells Fargo if he will lead him to the men suspected in the March stagecoach killings. Earp does so because the capture of the men would aid in his campaign to be elected sheriff. The stagecoach from Tombstone to Bisbee is robbed, and a posse including Wyatt and Morgan Earp arrest two men, who were released for lack of evidence following a preliminary hearing. The arrested men are friends of the Clantons and McLaurys, adding to the antagonism they feel toward the Earps. Ike Clanton and Tom McLaury ride into Tombstone with a wagonload of beef. They plan to meet their brothers, Billy Clanton and Frank McLaury, the next day. In the evening, Clanton begins roaming from saloon to saloon, card game to card game. Around 1:00 am, a well-oiled Clanton exchanges words with Doc Holliday at the Alhambra Saloon. Clanton suspects Holliday of spilling the beans about his secret agreement on the Wells Fargo reward with Earp, which threatens his standing in the "cowboy" (outlaw) community. Each men threatens the other, and Virgil Earp, the town marshal, is called to separate the two men. Clanton spends much of the night wandering around Tombstone and issuing threats against Holliday and the Earps. Wyatt brushes off a threat from Clanton and tells him to go home. Frank McLaury and Billy Clanton arrive in town. The two Clantons and two McLaurys are observed loading bullets into their belt at a gun shop. The four men go to the O. K. Corral, where they are overheard making threats against the Earps, and then to a vacant lot off Fremont Street. Virgil Earp calls on brothers Morgan and Wyatt, as well as deputized Holliday, to help disarm the men who were openly carrying weapons in violation of the law. Approaching the men, Virgil calls on the Clantons and McLaurys to turn over their guns, but soon a shot is fired and the "shooting becomes general." Within 30 seconds, the two McLaurys and Billy Clanton are dead, and Virgil and Morgan Earp seriously wounded. Coroner Henry Matthews convenes a formal inquest relating to the Clanton-McLaury killings. Sheriff Behan testifies that the shooting starting before the Clantons and McLaurys had adequate time to comply with Virgil Earp's demand that they disarm. Matthews concludes only that the men were killed by the Earps and Holliday, and does not assess blame. Ike Clanton files murder charges against the Earps and Holliday. Virgil Earp is suspended from his job as Chief of Police. Judge Wells Spicer opens a preliminary hearing to determine whether any of the Earps or Holliday should be tried on murder charges. Will McLaury, brother of two of the deceased men, arrives from Texas to join the prosecution. Wyatt Earp and Holliday are arrested and lodged in a jail on Sixth Street, where they will remain for the next sixteen days. Wyatt Earp is called to the stand as the first witness for the defense. He testifies that the firing began after Billy Clanton and Frank McLaury drew their pistols. Virgil Earp, still seriously injured, testifies from his bedside at the Cosmopolitan Hotel. Judge Spicer issues a decision exonerating the Earps and Holliday of criminal wrongdoing in the gunbattle. 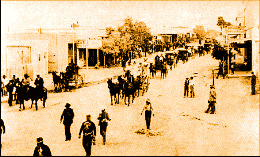 Virgil Earp is ambushed by several cowboys (including, it is generally believed, Ike Clanton, whose hat was discovered at the scene) in Tombstone while walking down Fifth Street at night. Earp survives the attack, but his arm is nearly ripped off by buckshot, leaving it nearly immobile for the rest of his life. A preliminary hearing is held to consider charges against Ike Clanton for assault on Virgil Earp, but the case is dismissed for lack of evidence. While playing pool in Tombstone, Morgan Earp is shot and killed by a rifle shot fired through the pool hall window. In the next week, Wyatt Earp and others carried out a merciless vendetta against those suspected in the attacks on his brothers. Among the victims were Frank Stilwell (shot in Tucson), Florentino Cruz (shot in a wood camp), and Curly Bill Brocius (shot in Iron Springs). Wyatt Earp and Holliday travel to Colorado, where the state's governor, Frederick Pitkin, denies Arizona's request that the two men be extradicted to that state to face murder charges resulting from the vendetta. Doc Holliday dies of tuberculosis in Glenwood Springs, Colorado at age 36. Virgil Earp dies. After the trial, Virgil had worked as a policeman, run a saloon, and dug for gold in California before returning to work in law enforcement in Arizona. Wyatt Earp dies at age 80. In the years since the trial he had lived in San Francisco, Texas, Mexico, Alaska (where he ran gambling halls and taverns from 1897 to 1901), and Idaho, among other places. Earp appeared on the sets of early Hollywood westerns, refereed boxing fights, prospected for gold, and worked on a never-completed autobiography.